If you visit the mountainside in the Northwest Highlands, you can admire the terraced fields, and the beautiful buckwheat fields. 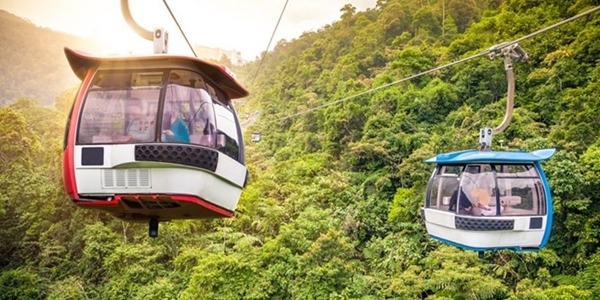 Are you planning to travel to Vietnam in October? Then do not skip this article. Vietnam Immigration Services will give you a great suggestion for your trip. 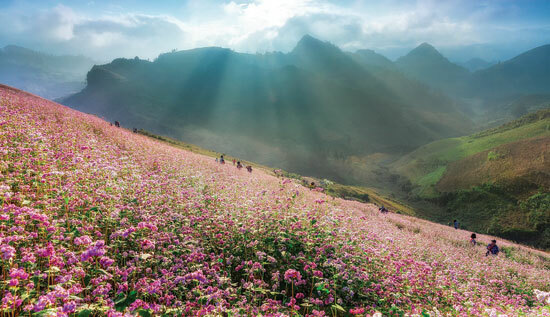 When can travel to Vietnam to see flowers of buckwheat fields? 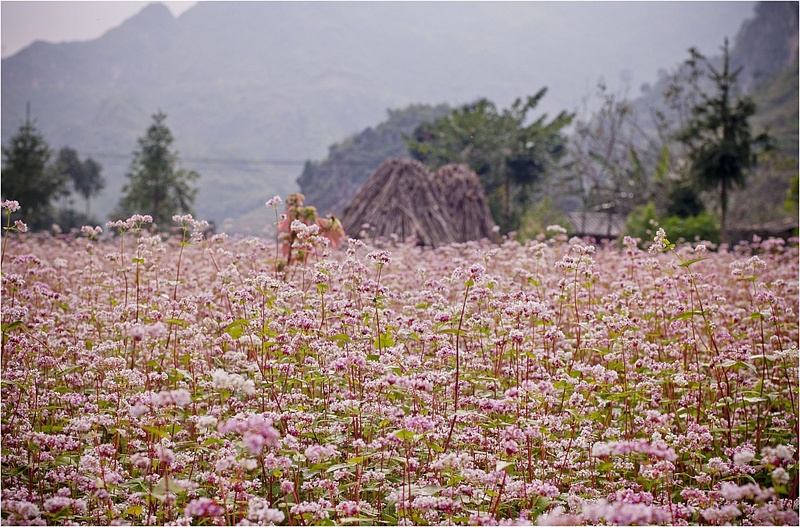 Well, the season of buckwheat flowers in Ha Giang is from the beginning of October to the end of December. 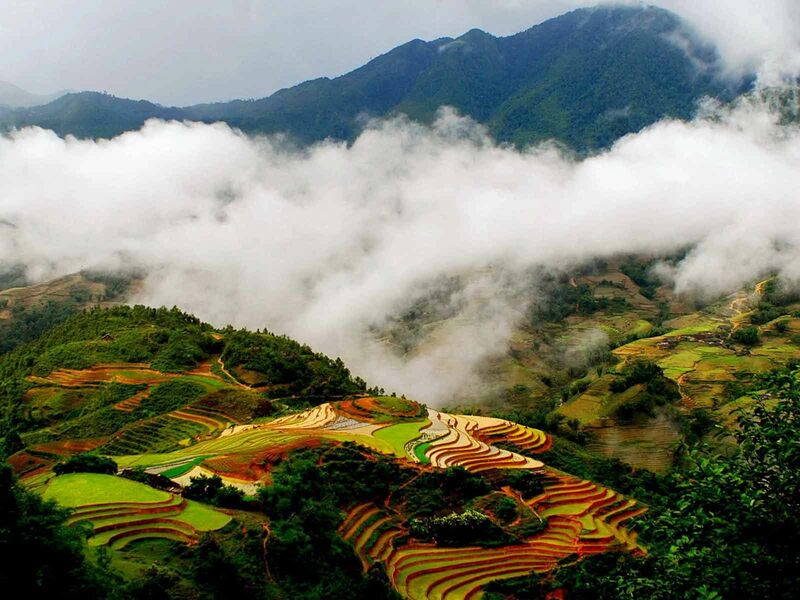 You only need to spend three days is enough to go to the most attractive tourist attractions in Ha Giang. How can go to Ha Giang? Travel by car: From Hanoi, you should take the night coach Hanoi – Ha Giang depart from My Dinh coach station at 9pm and arrive at 5am in Ha Giang (luxury car bed, booking via phone and some reputable companies are: Bang Phan, Hung Thanh, Hai Van …). Price from 260,000 to 300,000 VND / person. 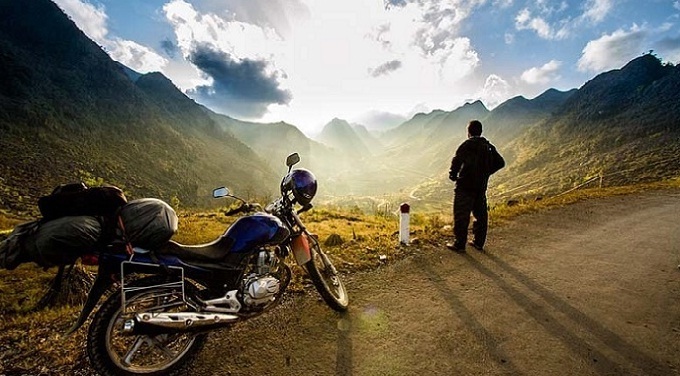 After arriving in Ha Giang, take the provincial bus to move between locations or rent a motorbike to travel. Option 1: Departure from Ha Noi – Son Tay (go to street 21 in Co Nhue) – Trung Ha bridge – Co Tiet – Phong Chau bridge (pass Phong Chau bridge then turns left) – Go along Thao river to Phu Tho Commune – Doan Hung then turn to Tuyen Quang – along national highway 2 to Ha Giang (length about 300 km). Option 2: Departure from Hanoi – Vinh Phuc – Viet Tri – Phu Tho – Tuyen Quang – Ha Giang (or arrive to highway 2C and Highway 2, 280 km long). Departure from Hanoi in the morning and arrive in Ha Giang in the evening. You can have a rest in the city, or choose to go to Quan Ba ​​(about 40 km from the city) or Yen Minh to rest. 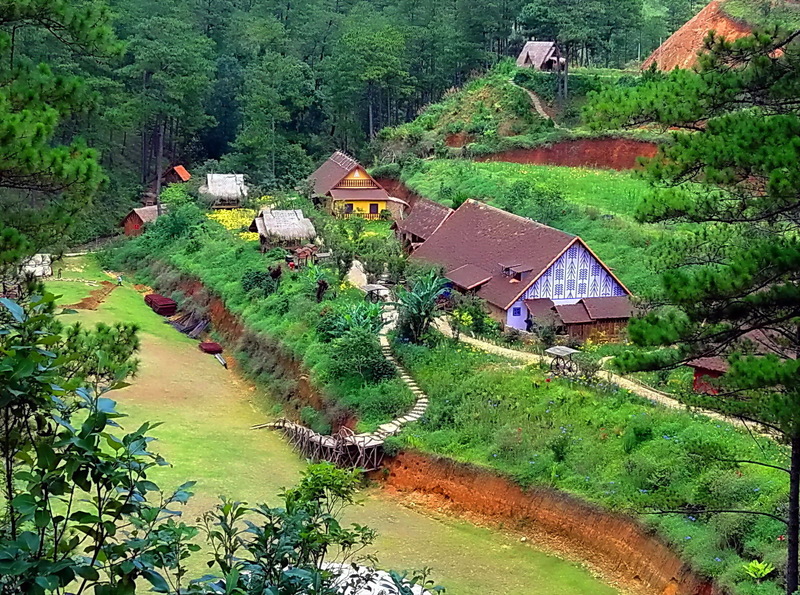 However, stay in Ha Giang most reasonable to ensure health, after a distance of 300km, your body need to rest. 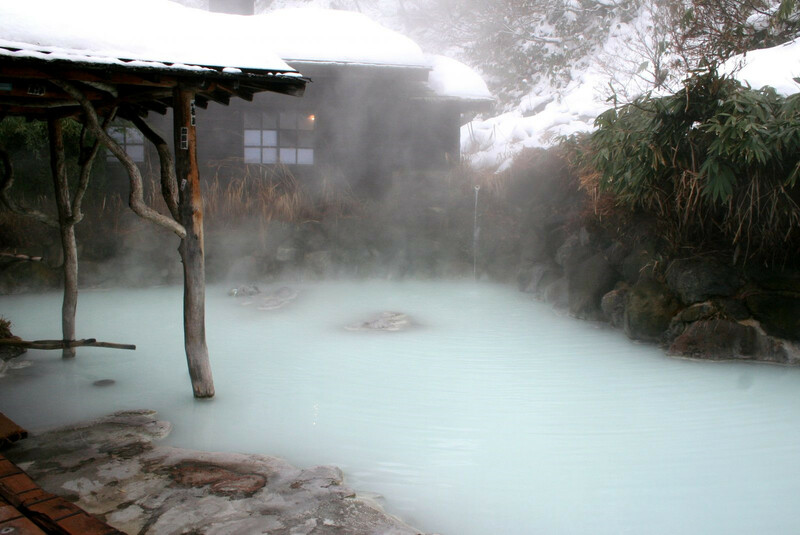 In the evening you have time to go around the city and eat then have a rest for tomorrow to continue the journey. Having breakfast. Leave Ha Giang to Quan Ba, Yen Minh and to Dong Van plateau (can stop lunch in Yen Minh or Quan Ba). On the way to Dong Van, you go to Pho Bang (5 km) to visit the sleeping town. There are ancient houses with unique architecture. On the way to Pho Bang, you also have the opportunity to go through the valley of roses and a large buckwheat field on the edge of the road (about 500 meters from the town). Leaving Pho Bang, the next place at the foot of the slope is Sung La Valley. Where Lung Cam village is famous for its home in the movie “Pao’s Story” and the beautiful white buckwheat fields. 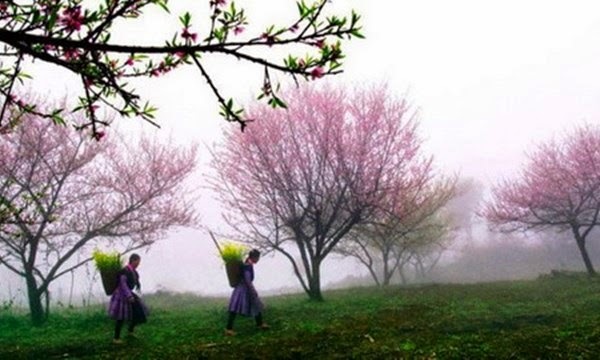 Life in Lung Cam is very peaceful, you will be visiting the ancient homes of the H’Mong ethnic, the road full pear trees and beautiful temperate pine trees. 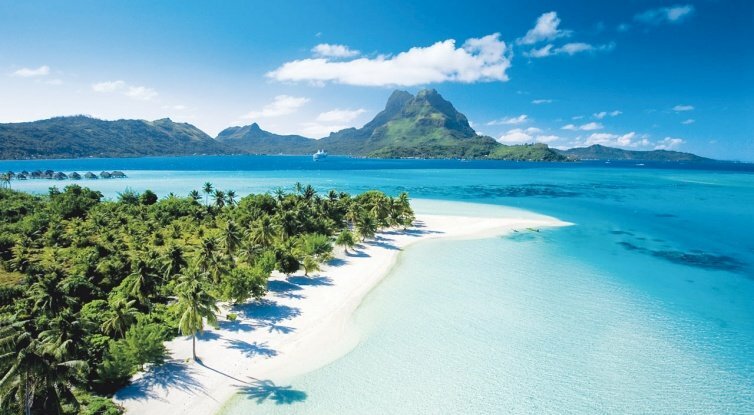 Leaving Lung Cam, next place is Sa Phin. 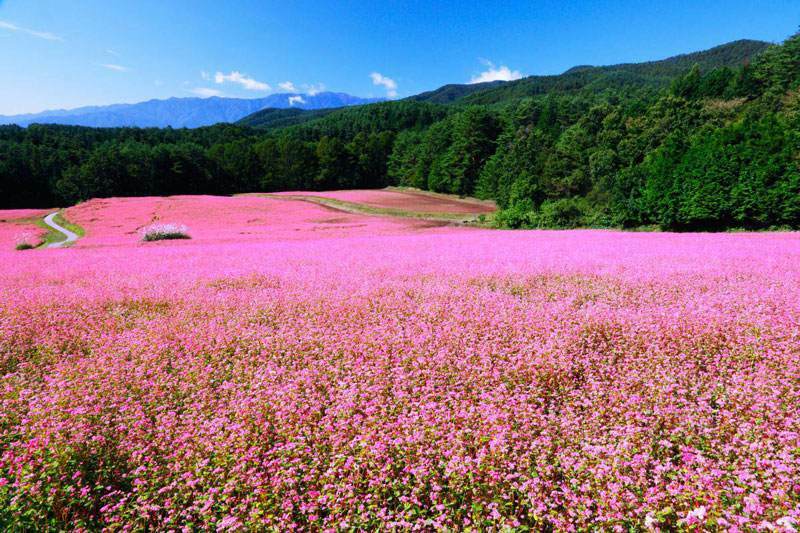 On the way you will meet a buckwheat flower field lying right at the corner of the moon rock. Arrive in Sa Phin, you visit the palace of the Vuong family (or the king of Meo). This is one of the ancient residences of wealthy families thanks to the drug trade in Ha Giang. From the palace of the Vuong family, you go back to the crossroads to Lung Cu flag pole. Pass Pho La, Ma Le to the Lung Cu flag pose – the first place on the map in the S shape. 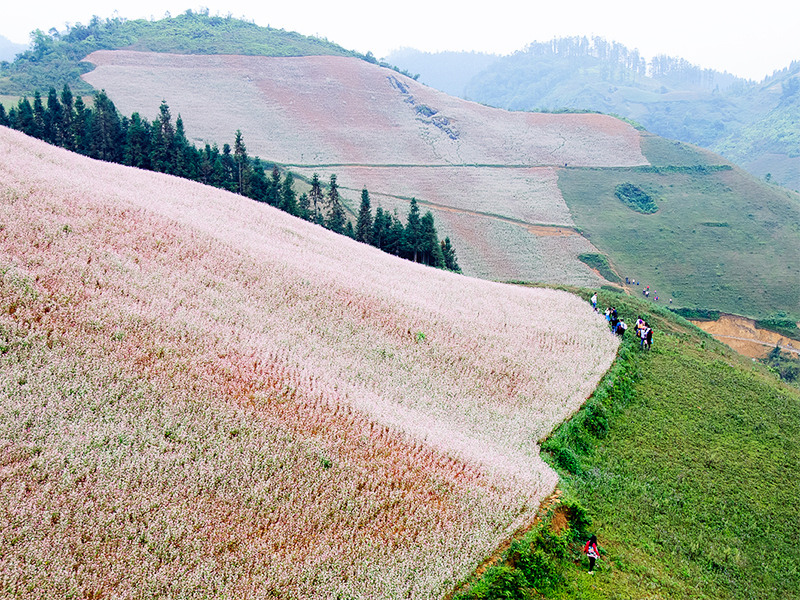 On the road from Ma Le to Lung Cu, you will see a large buckwheat flower field on the hillside. This is the place where most buckwheat flowers are planted at the present. The journey continues to Lung Cu flag pole. After arriving Lung Cu flag pole, you can choose to check land mark 428 and then go to Dong Van or go straight on Dong Van ancient town. (take note of the time issue because going to land mark 428 is completely by walking for nearly 3 hours). Dinner and stay in Dong Van, end of day 2. Having breakfast at Dong Van and go to conquer Ma Phi Leng, go to Meo Vac, Bac Me and then back to Ha Giang for have lunch. Arrive at Hanoi late at night. This trip is over 400 km long so you need to prepare for health, eating, resting properly to ensure a safe and healthy journey. 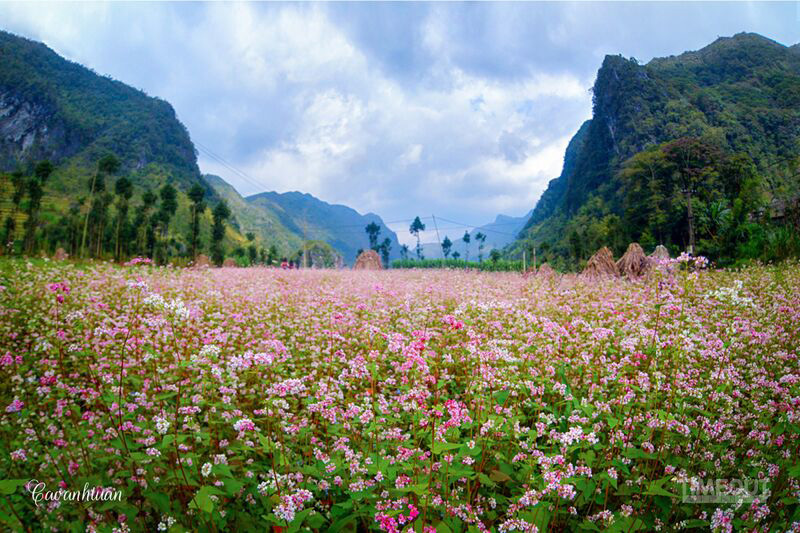 With this schedule you have visited the most attractive and the most beautiful buckwheat flower fields in Ha Giang. However, because of the short time you will not have much opportunity to learn and experience the culture with the indigenous people. 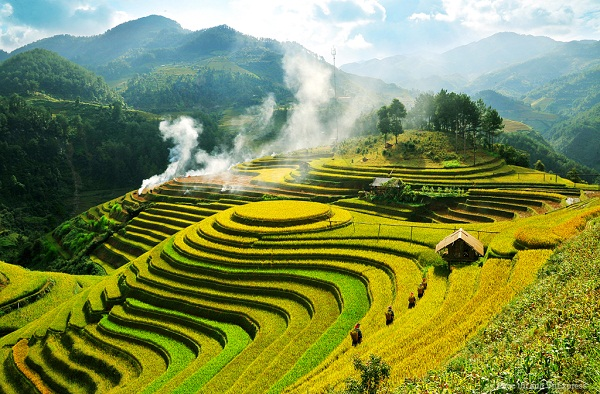 To visit Vietnam, especially visiting Ha Giang province, you should find information and booking accommodation in advance if you are going in a group, avoid the situation as no room for booking. 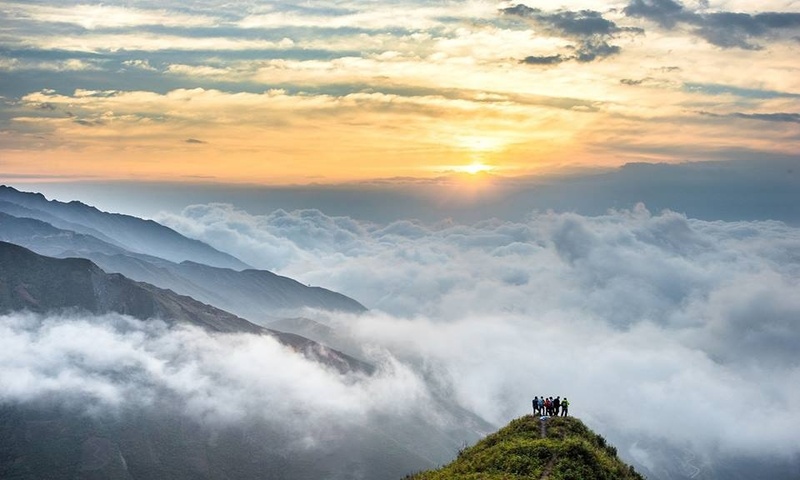 The price of service in Ha Giang is higher than other tourist locations in the North, so you should be prepared psychologically and remember the price before. If you travel by motorbike, you should bring spare equipment and spare tire, avoid going on the slope without car repair shop. Do not overcrowd to ensure safety on the road.